This confirms what we expected after a ferocious rainy season that wreaked havoc throughout much the state. San Joaquin Valley and most of Southern California remains in a “moderate drought”. 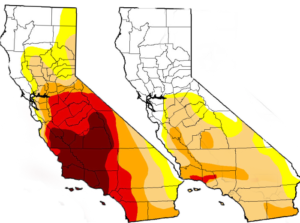 Much of Santa Barbara and Ventura county areas is in severe drought or extreme drought. Although that statistic is down from 2016. In case you want to know where your water comes a KQED website has an interactive map. Check it out. Do you want to know where your water comes from? Also Briones, Lake Chabot, Lafayette -all full. Felicia Marcus, Chair of the State Water Board has expressed relief that water conditions have improved so dramatically, but state policy makers remain cautious. They voted to continue with mild drought rules and re-evaluate in May. We will know more about any irrigation regulations by that time. And, water conservation will likely to be an important issue. Wasteful practices such as hosing off pavements and use of hoses without nozzles remain banned. Sources for this article: San Jose Mercury News, NOAA, KQED.